The classic tales of Winnie The Pooh have many great friendly characters. One of the Disney favorites is Eeyore a very soft spoken and caring friend to Winnie The Pooh. 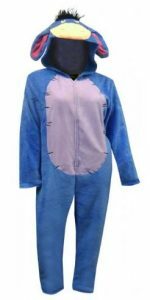 This is a pair of onesie pajamas that transform you into Disney’s Eeyore character, wear it for bed time or lounge around. Maybe even throw it on for a dress up party or as a costume for Halloween. Featuring a hood that when is on will look just like Eeyore’s head with floppy ears and tuffs of hair. The body has a front zipper and is all purple with a beige belly. Made from a very durable, warm and super soft plush material. This one piece pajama is available in a wide variety of women’s sizes that range from Small to XL.